At recently held additive manufacturing (AM) events hosted by Dassault Systèmes in Coventry and Bristol audiences saw the latest developments and were given a vision of the future for this exciting technology. Additive manufacturing, which utilises 3D printing technologies, is an alternative to production processes such as milling, casting and precision forging. It has been widely adopted in the aerospace industry for creative product design and prototyping. And it is growing its footprint into large and medium scale production. The innovative and disruptive nature of AM enterprise creates opportunities in many different areas such as remote fabrication for support and maintenance, rapid prototyping for realizing new concepts and experiences and, perhaps most importantly, developing designs that were previously impossible to fabricate using standard machine tools. The purpose of the two events was to look at the technology, trends, challenges and opportunities that AM presents and demonstrate an integrated set of strategically appropriate applications and solution experiences that provide design and manufacturing validation at every step, end to end. Audiences saw how flexibility in part design, production and testing helps reduce waste and costs associated with manufacturing complex parts. Many people do not know that almost every type of metal can be used for AM by putting down successive layers of metal powder that is then solidified using precisely targeted heat from lasers. 3D printing relies on digital simulation technology for design. The process differs from that for manufacture with subtractive machine tools because there is no machining and minimal finishing required to create parts. And because parts do not have to conform to the strictures of machining they can take on new forms. At the events, presentations on Process Optimization: Closing the Gap Between ‘As-Designed’ and ‘As-Manufactured’ explored how technology allows a 3D digital model to be perfectly reproduced as a solid metal object. 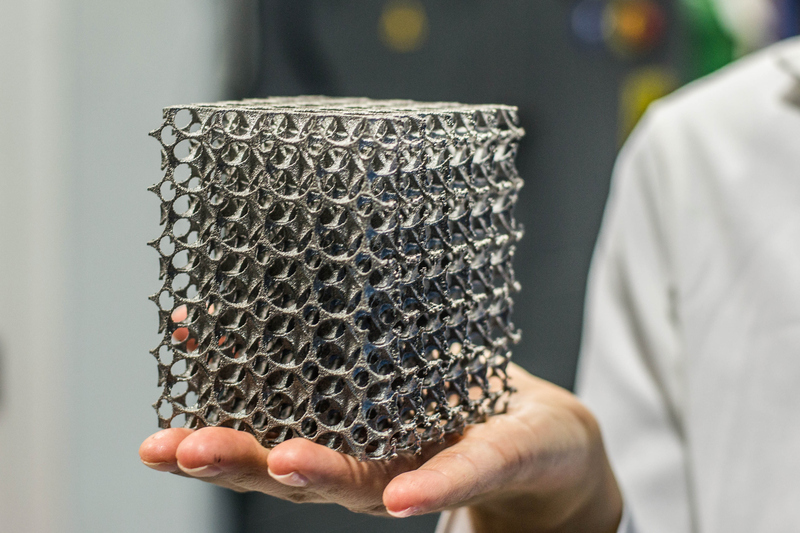 AM has the ability to build parts on demand with designs that include internal cavities and lattices – known as bionic structures, that reduce weight and maximise strength without compromising mechanical performance. Even complex mechanical parts – an encased set of gears, for example – could be made without assembly. Attendees learnt that using integrated design and analysis software on a unified platform enables ‘hard points’ i.e. points of contact, to be defined as design drivers. This means that points of contact and space envelopes along with functional and structural requirements can be used to define forms automatically in a process called, generative design. Integrating finite element (FE) analysis into the design process in real-time makes it possible to develop products with the precise structural characteristics needed to match their function. In its 2016 report Engineering UK stated that Britain needs nearly 70,000 more engineers every year to meet industry demand. Designing and making with AM not only saves time but can also help overcome the current skills shortage for highly qualified design engineers because design processes are both automated and automatically validated in real-time as designs progress. Companies of all types and sizes were represented at the two events. Many share a passion for innovation and enthusiasm for the progress of Britain as an engineering leader. Those that attended are helping shape our industrial future as an advanced manufacturing powerhouse that capitalizes on technology to build better national industries that can compete on a global stage.